Monday was an official day off in Tuva. 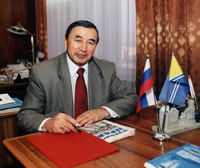 Since 1991 Shagaa (movable according to the Lunar Calendar) and the Day of the Republic (August, 15) have been celebrated officially after decades of oblivion. January, 30 this time was fixed by the Resolution of the Great Khural of Tuva as the festive day based on the recommendations of the Tuva's Kamby-Lama. Night preachings took place in all the lamaseries of the republic and in the Drama theatre as well. People tried to fight the sleep as it is a general belief that one of the Deities during the night on the Shagaa's eve counts the souls. If you are asleep you won't be counted and will be devoide of a large portion of happiness. Tuva authorities closed and quarantined all schools in the republic's capital as flu epidemic spread, sickening 25 percent of pupils in each class, duty Town Hall officer told Itar-Tass. Founded a year ago on the All Russian Students' Day, January, 25, the youth 'Pyatiletka' club has celebrated its 1st anniversary. The club is hosted on the 2nd floor of the sportcomplex and during the daytime is the place for training sessions of breakdancers, rollers etc and during the nightime is a popular discoclub visited mostly by students. The club is financially supported by the Kyzyl municipal committee for the youth and sports. The yeasterday's birthday party in the club started with the official ceremony of honouring the best Tuvan students who in the 1st part of the day were awarded with the Mayor's premia. 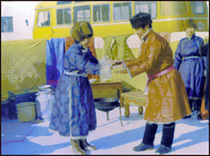 Yes, such trips are realized by Tuvan drivers, mostly of the private-owned buses. Two-way trip through Mongolia to Manchuria costs one 10000 rouble (appr 350 dollars). Buses take a start from the parking lot near the Drama theatre in Kyzyl every Tuesday. It is known as a shopping trip for Tuvan merchants who buy there cheap Chinese goods. 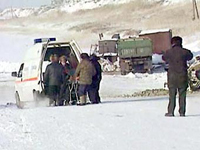 Today early in the morning a working group of the Tuvan Department of the Emergency Ministry has held a number of sittings devoted to possible causes of the accident with the bus on the ice road near Kara-Khaak in which yesteray 2 people died. Two persons have drowned after a bus plunged through ice covering on the Big Yenisei, the local department of the Emergency Situations Ministry reports today. All the other 20 passengers of the privately-owned bus have been rescued. The accident took place at 4.40 p.m. local time (9.40 GMT) near the village of Kara-Khaak 20 km to the north of Kyzyl when the bus crashed through the 55-cm thick ice. 'Mystery of Asia' fashion collection, presented by the 'Edegei' ensemble (Tuva) at the V All-Russian Festival for the Youth and Children's Creative Works held during the school vacations in Moscow, was recognzed the best and awarded with the Grand Prix. Tuvan models, senior school-children, were greated with a storm of applause. They looked very professional in spite of the other competitors including those from Moscow. This collection was already marked by the highest estimation of the jury at the Panmongolian contest held in Ulan-Ude. At dawn with the first sunrays on the 30th of January Tuvan New Year (Shagaa) will come. Preachings for the well-being of the people will take place in all the Tuvan lamaseries at the pre-Shagaa night. The preaching will also be held throughout the night from the 29th to the 30th of January in the Drama Theatre of Kyzyl. Every week you can be a participant of the photo-contest 'One Day in the Life of Tuva and Tuvans'. 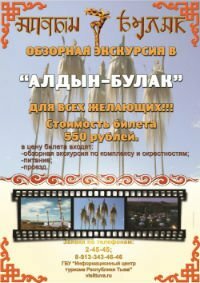 No matter where you are - in Tuva or outside it but then necessarily in a company of Tuvans - make a picture of what you are witnessing, send your photo to the Tuvan 'Uraanhay-Weekly' (uraanhay@mail.ru) and become a winner of the photo-contest. The winner of the week will get a prize money (10 dollars), that of the year - an annual subscription to the Tuvan weekly.